Senator McCain and Governor Palin make great efforts to exploit a perfectly prudent remark that Senator Biden made about his running mate. Biden suggested that Obama would be tested internationally early in his presidency. McCain and Palin want us to believe that Biden’s comment laid bare Obama’s inexperience and the country’s vulnerability if the Democrat wins the presidency. Nonsense! Biden was right in pointing to the likelihood that the next president will be faced with a foreign crisis. After all, history has taught us that new presidents tend to be tested early on by international foes. Convinced that Barack Obama will become the next president, Biden did not speak generically of new presidents but mentioned his running-mate—although his comments were as applicable to McCain. Since the Senator of Arizona is very much into the “war on terrorism,” he should know that transnational terrorists in particular are eager to force U.S. presidents to deal with major terrorist incidents shortly after they take office. And in this respect, terrorist foes do not distinguish between Democrats and Republicans. Thus, the attacks of 9/11 occurred less than eight months into George W. Bush’s first term, and the first terrorist strike against the World Trade Center in New York took place in February 1993—only a few weeks after Bill Clinton was sworn in as president. One could also argue that the downing of PanAm Flight 103 on December 21, 1988–exactly one month before then Vice-President George H.W. Bush succeeded President Reagan—was not only meant as a parting shot for Ronald Reagan but just as much as an opening salvo for the elder Bush’s presidency. After all, it fell on the new man in the oval office to deal with the horrific terrorist incident that caused the death of 270 persons—most of them Americans. Unless he suffers from extended senior moments, McCain would surely remember. Unfortunately, his much younger running-mate is unable to refresh his memory. Powell’s Endorsement of Obama: Move Toward Redemption? As I watched and listened to Colin Powell’s endorsement of Barack Obama earlier today, my resentment towards the retired general, former Chairman of the Joint Chiefs of Staff, former National Security Adviser, and former Secretary of State softened. Like many Americans, I would have voted for Powell if had he had run for the presidency before he became the linchpin of the Bush administration’s campaign to convince people at home and abroad that Saddam Hussein possessed weapons of mass destruction and that this existential threat had to be removed militarily. Powell’s performance before the UN Security Council in February 2003 with visual WMD-“proofs” and all was his darkest hour and in the words of his then right-hand man “a hoax.” After advising the president not to go to war against Iraq, after protesting behind closed doors the administration’s decisions in favor of torture and the extraordinary extradition program (meaning the outsourcing of torturing terrorists or suspected terrorists to torture-happy countries), Powell could have made a real difference by resigning as Secretary of State. Instead, he went along with those who did not act in the best interest of the country. Powell’s endorsement of Obama was an act of courage albeit nothing comparable to what his resignation in 2002 or 2003 would have been--and a move toward redemption. I am certain that he will be attacked by his longtime Republican admirers and that his motives will be questioned. The same voices that have fed racist sentiments among a small segment of the electorate will argue that race was the decisive factor in Powell’s decision to side with Obama. I do not buy the race thing for a second. Powell was and is part of the predominantly white establishment; he is the last person to have a racial axe to grind. And precisely this makes this endorsement an important one. Listening to the pre-debate cable show hosts and pundits, the overriding question was not what policy positions John McCain would take in the last presidential debate but rather whether and how the Republican candidate would attack his opponent on so-called character issues, namely his association with former Weather-Underground leader William Ayers. It was obvious that the talking heads hoped for a fight—not a high level policy discourse. In that, they were aligned with the Republican base and people like Sarah Palin and Rush Limbaugh. Both got part of what they wanted: McCain performed as eager attack-dog (supposedly in the service of his country) trying to bloody Obama (supposedly a shady character who associates with terrorists). But while McCain got hot under the collar and repeatedly seemed to breathe hard to keep from losing his temper, Obama remained composed and seemingly untouched by his opponent’s punches. By referring to Republican and Reagan friend Walter Annenberg and his foundation’s funding of The Chicago Annenberg Challenge Grant, where he worked with Ayers, Obama took the wind out of McCain’s guilt by association attempts. Even less effective was McCain’s effort to link Obama to ACORN, an organization allegedly threatening the fabric of our democracy. Apart from the political class and the interested public, who in the audience knew what ACORN is and what the Arizona Senator was talking about? When everything was said and done, the attack-dog had thrown some read meat in the direction of the herd he has trouble to lead. But the barks sounded tired and old and not at all relevant in the midst of a severe financial, fiscal, and economic crisis that is hitting and preoccupying Wall Street and Main Street. If initial polls and focus group results were right, McCain’s offensive did not win over those he needed to persuade: Independent voters who have not yet made up their minds. One wonders what tactics the McCain campaign (and like-minded groups) embrace next. What must it be like to be Rick Davis, knowing that each morning you have to get up and lie to the press? What kind of a guy pretends he can't understand the difference between "legal" and "right" -- as if there's no such thing as a legal but immoral and abusive act -- all in the service of a candidate who he claims is more patriotic and has a better character than his opponent? Really, how do guys like this sleep at night? And how does McCain sleep at night knowing what disgusting bile is being foisted on the American public in his name? During the primary season, I supported Senator Hillary Clinton. I am still convinced that she has more knowledge of the most important policy issues of our time—both domestic and foreign—than Senators McCain and Obama. I still believe that Senator Clinton would be the best of all the candidates running for the highest office in both parties’ primaries to lead skillfully and resolutely during times of crisis. During the primary season, I was appalled by the relentless attacks on Hillary Clinton by fanatic Obama supporters and liberal media pundits, their false charges of racism, and their gender bias, yet I will cast my vote on November 4th for Senators Barack Obama and Joseph Biden. I never considered the McCain/Palin ticket, because Senator John McCain and Governor Sarah Palin are unfit for the president’s and vice-president’s office. Grumpy old McCain pretends to put his “Country First” according to his team’s campaign slogan. But nothing contradicts this claim more than his choice of the intellectually challenged Sarah Palin as his running mate. McCain and whoever else played a role in picking this self-proclaimed “Joe Six-Pack” and “Pig with Lipstick” demonstrated contempt for women as smart as or smarter than mediocre McCain. If the McCain camp believed that a female running mate would win over angry Hillary Clinton supporters and assure victory in November, they could have selected one of many formidable Republican women politicians, among them senators and current or former governors. Instead, they chose the one with the best looking legs and the mentality of an attack dog. What a message they sent to women and girls. Since Sarah Palin has voiced frustration over McCain’s reluctance to attack Obama because of his membership in the Reverend Jeremiah Wright’s church in Chicago, it is probably just a question of time, when the most extreme passages from Wright’s sermons will be revisited in attack ads. If one questions Obama’s judgment to remain a member of the Wright church as long as he did, and I do question this, one must also question McCain’s affiliation with anti-Semitic preacher John Hagee and Sarah Palin’s hand-on blessing by witch-hunting Pastor Thomas Muthee. Taken together, we know of more troublesome associations of the McCain/Palin side than the Obama/Biden ticket (Here is a link to another post on McCain's unfitness to serve as president). I'd say that Palin did well, but she was hampered by two factors, one in her control and one not. Out of her control was the fact that she had to defend a set of policy positions that are real losers as far as the public is concerned. So she had no comeback to the remark that McCain isn't a real maverick, nor could she rise above generalities of "fighting for American" and descend to the land of actual policy. In her control is the fact that her knowledge of the facts was broader than before, but still a bit thin. So the debate was about 1/2 hour too long for her; she sounded repetitive in the ending part, while Biden showed emotion and ended on a strong note. Plus, she had a few deer in the headlights moments when she was asked a question she wasn't prepared for. On the use of nuclear weapons and the VP's powers, her mouth was engaged before her brain was in gear and she ended up spouting a bit of her trademark drivel. But Palin held her own for the most part, which was, needless to say, leaps and bounds above expectations. The real revelation of the night was Biden, the forgotten man in the quartet of candidates. He was for the most part precise, effective, and tough without ever appearing condescending. As I said, he was the more emotional of the candidates, while Palin seemed more robotic in comparison. And he consistently flaunted the Democrats' advantage on the issues while tying Palin and McCain to the policies of the Bush administration. So Palin did well and did much to erase the stigma that she might drag the ticket down all on her own, but in the end a small to moderate sized win for Biden. Now let's see what the focus groups have to say. Michael Bloomberg wants to serve a third term as mayor of New York City. He even convinced term limit champion Ronald Lauder that the current financial crisis calls for a one time only waver of the two-term limit for the mayor—not for city council members and other elected officials. There is no need for term limits in democracies--not in local, state, and national jurisdictions. If citizens are fed up with elected officials, as they are now with President Bush and members of Congress, they have the power to throw the rascals out when the next election comes around. If they are satisfied, and even happy, with the performances of the men and women they elected, citizens should have the right of reelecting them as many times as they want. In 1995, the U.S. Supreme Court struck down state-imposed congressional term limits in U.S. Term Limits v. Thornton as unconstitutional and thereby invalidated the restrictions imposed in 23 states. The court ruled, “In the absence of a properly passed constitutional amendment, allowing individual States to craft their own qualifications for Congress would thus erode the structure envisioned by the Framers, a structure that was designed, in the words of the Preamble to our Constitution, to form a "more perfect Union." However, term limits are in place for more than a dozen state legislatures, more than half of the governors, several of the country’s largest cities, and many more other local jurisdictions. Yes, I know that the proponents of term limits do not agree with the argument that term limits are actually undemocratic. They like to point to ancient Greece and Rome where term limits for elected officials did exist. That was at a time when the problems of city states were far less complex and numerous than for today’s local, state, and national governments. Newly elected officials learn on the job. But while newcomers in executive and legislative offices learn the ropes, the permanent bureaucracy and long-lasting lobbyists have the upper hand in pushing their own agendas. Rotation in office does not make sense because it increases the power of unelected and permanent players. If Mayor Michael Bloomberg wants to run for a third term, he should go for it—after a referendum that repeals term limits for all elected offices in the city. The Senate Bailout Vote: Yawn! In a vote as placid as Monday's House vote was stormy, the Senate just passed a slightly revised bailout bill by a comfortable 3-to-1 margin. Perhaps the administration has scared enough senators into believing that there's a true crisis; if so, it worked. The vote analysis is much less interesting this time around too. No defections from the wings, no stunning defeat of major legislation, etc. There was a slight partisan tilt, as before -- 80% of Dems voted in favor, as compared with 70% of Reps. Also, electoral factors played a role -- those with close races were more likely to vote against, as compared with those not up for reelection or with safe leads. So, if anyone has any more hypotheses about what went on, and the data to test it, we'd be happy to run the numbers. The real question is whether the House will take this up again on Friday, and to what result. OK, now we've seen that the defection from the wings in the bailout vote was true in fact. But is it true in theory? Now let's assign preferences to three groups of House members: Conservative Republicans (CR's), Moderates (M's) and Liberal Democrats (LS's). In this instance, the CR's and LD's were both against the idea of a bailout, so they agreed on dimension 1. The Democrats didn't like it because they thought it was socialism for the rich and capitalism for the poor; the Republicans didn't like it because they just thought it was socialism. 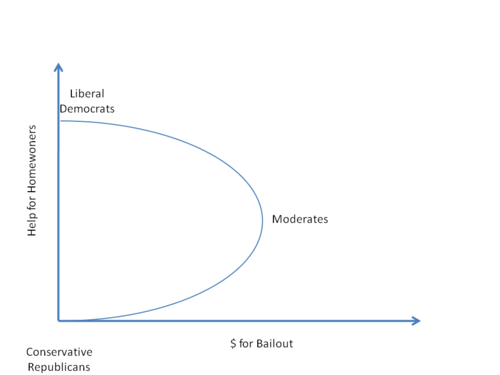 Moderates from both parties supported the bailout as necessary to save the financial system. And Democrats were more favorably disposed towards helping homeowners than were Republicans.